The World Festival of Folk Ensembles of Polish Diaspora, organised every three years in Rzeszów, will host several hundred dancers from all over the world from 23rd to 30th July 2014. It is the16th edition of this undertaking. 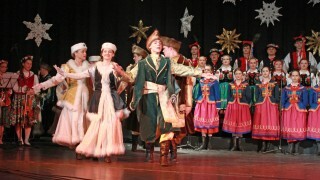 The Polish Song and Dance Ensemble “Wilia” will represent Lithuania at the festival in Rzeszów. The World Festival of Folk Ensembles of Polish Diaspora is one of the most important events both in Rzeszów and in Podkarpackie Voivodeship. Every year many people attend the concerts. The history of the Festival of Polish Song and Dance Ensemble of Polish Diaspora dates back to 1967. It was the sheer chance that made its organisation possible. The idea of the undertaking was connected with the stay of the Song and Dance Ensemble “Krakus” from Genk in Belgium in Rzeszów, which came at the invitation of the Song and Dance Ensemble “Bandoska” from the Voivodeship Community Centre in Rzeszów. After the meeting of the two ensembles a joint idea was born to organise cyclical meetings of Polish folk ensembles and invite a large number of Polonuses, i.e. Poles living abroad, to participate in them. About 30 folk ensembles of Polish Diaspora will participate the 16th edition of the World Festival of Folk Ensembles of Polish Diaspora, from which each will consist of at least eight pairs of dancers. The programme of this year’s festival was divided into two parts. In the first, pre-festival one, the ensembles were presenting themselves not in Reszów but in the selected towns of the whole Podkarpackie Voivodeship from 20th July to the afternoon of 23rd July 2014. The second part, the main one, started on 23rd July in the afternoon and will last until 30th July. The Polish Song and Dance Ensemble “Wilia” is once again taking part in the festival in Rzeszów. It is the oldest ensemble in the Vilnius Region which has been promoting Polish culture, folklore and tradition for more than 50 years not only in Lithuania, but also abroad. The ensemble has in its repertoire Polish national dances, regional suites from nearly all regions of Poland, but also songs and dances from the Vilnius region. Tłumaczenie by Alicja Dudzik	w ramach praktyk w Europejskiej Fundacji Praw Człowieka, www.efhr.eu. Translated by Alicja Dudzik	within the framework of a traineeship programme of the European Foundation of Human Rights, www.efhr.eu.